b) on the fights that really do matter, Tillis continues to vote and act in lockstep with Trump. 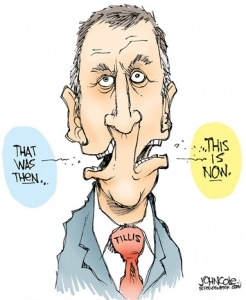 In other words, any talk of Tillis being some kind of “maverick” is just plain silly. Take, for example, the critical issue of the ongoing right-wing assault on the federal courts. Just yesterday, Tillis continued his knee-jerk support for Trump’s parade of unqualified ideologues by supporting Allison Rushing of North Carolina, who will join the Fourth Circuit Court of Appeals. “In his role at DOJ, Readler filed the government’s brief in the case, in which the Trump Administration argued that key provisions of the ACA were unconstitutional. Tellingly, Readler was then nominated to a highly influential federal judgeship in the Sixth Circuit – on the very same day he filed his brief. Readler’s decision to file the brief was so striking that three Justice Department lawyers refused to sign it, and a veteran Justice Department lawyer resigned in protest. Chad Readler, in contrast, apparently could sleep at night knowing that if his legal argument was successful, over 50 million Americans, including cancer patients, people with disabilities, and pregnant women, would lose health insurance. Should we have expected anything different from Readler? The answer, sadly, is no. The bottom line: Tillis is continuing to do what he’s always done — present himself to the public as a modern, affable and seemingly reasonable conservative while, at the same time, doing virtually everything in his power to advance the agenda of the far right. Let’s hope his constituents catch on soon. Well at least he doesn’t deny climate change! Good boy.